The village of Xidera in western Lesvos seems an unlikely place for a state-of-the-art winery but there it is. 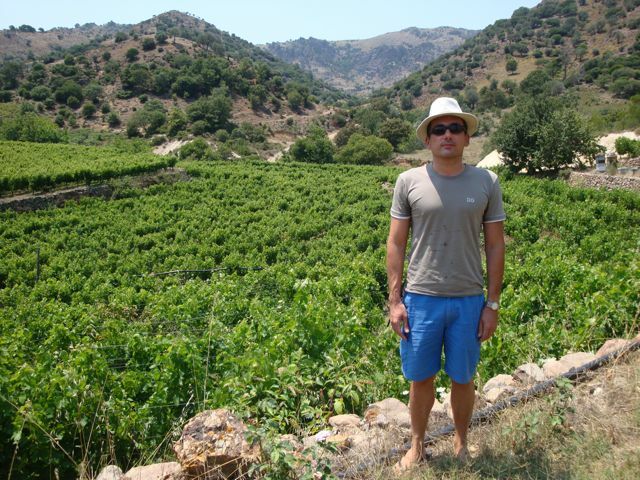 Run by Ioannis Lambrou, an articulate and intelligent Athenian with his family roots in the village and probably the only guy in town who listens to the Velvet Underground, a visit to the winery is a must, as is leaving with several bottles or boxes after the tour and tastings. We traveled around Lesvos with a box of their excellent white and many bottles of reds, then continued on to Chios and finally to the island of Kea where we spent the rest of the summer drinking Methymneos and turning our friends on to it. 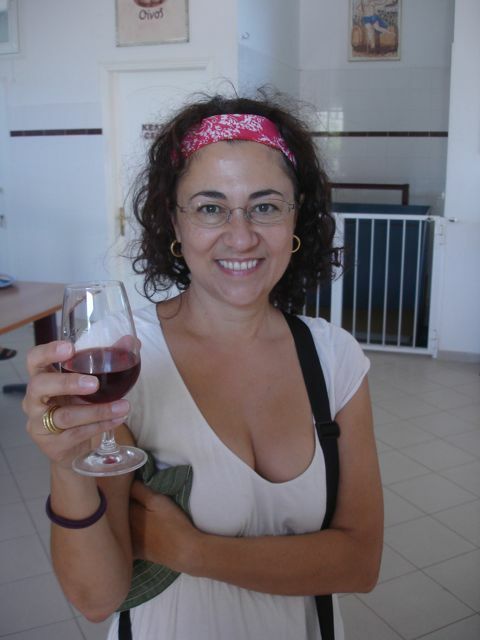 "I can name and praise the wines produced in other cities and their names I do not forget. 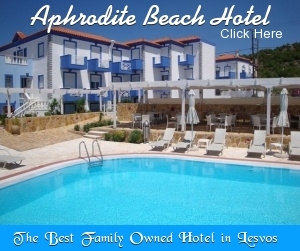 But none of them is compared to the wine of Lesbos." Unfortunately, the ancient Lesvos Grape Variety, which produced this exquisite wine, was almost destroyed by phylloxera at around the middle of the 20th century. It was only in 1985 that the family of Dimitris Lambrou, editor of the historical research magazine «Davlos», started replanting, using buds from the last remaining vines of the island grafted on rootstock resistant to phylloxera. The ancient variety was later identified and classified as unique through the use of DNA techniques. It was the firm belief of the D. Lambrou family in the great winemaking potentials of the Lesbos Grape Variety which ignited this quest and led to the dawn of a whole new era for wine-making on the island. Methymneos is a product of organic farming. True to the ancient tradition of the island, they do not use industrial fertilizers or agrochemicals in their vineyards. 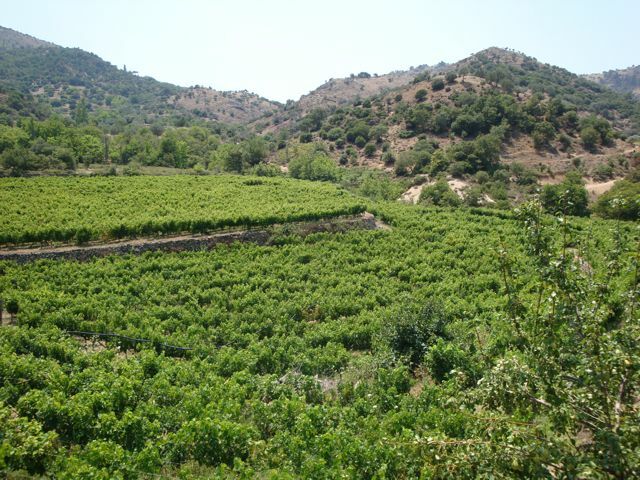 Their grapes grow completely naturally, according the laws of the household economy of villagers in Western Lesbos, who have ignored technological evolution for centuries...This is a matter of principle, essential for the quality of the product and the health of consumers and in respect of Greek history and tradition. The vineyards are situated at an altitude of 300m, in the crater of the inactive volcano of Western Lesbos, near the village of Xidira. The whitish sulphurous and volcanic soil and the Mediterranean mountain micro-climate are ideal for the production of high quality wines. "In our neo-classical winery we produce our wine, harmoniously combining the ancient oral and written tradition with state-of the-art wine-making equipment as well as modern techniques. Our french-oak barrels, where the wine ages, are never used for a period of more than four years. Its unique clean and brilliant ruby-like red color, which is characteristic of old wines, is combined in a very distinctive way with the light and young aromas of honey and citrus fruit and an equally unique taste that is also an interplay of the old and the new. 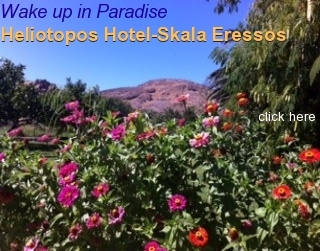 These special characteristics of Methymneos stem from the grape variety by which it is produced as well as the soil of the inactive volcano where the vineyards are located." The name «Methymneos» was an adjective attributed to Dionysus (Plutarch, Moralia, B, 648e), derived from the words methy(=wine), hymeneos(=wedding) and the hymn of the symposia, and thus reflects the mythical and noble nature of our wine. The new Methymneos white which I drank bottle after bottle of with Ioannis Lambrou at Christmas (every night we went out he brought a case and we gave a couple bottles to the taverna and we drank the rest) won a bronze award at the 3d competition of wines made from organic grapes that is organized by DIO (the Greek organic product certifying agent). Wines that usually win at such competitions come from well-known terroirs* and grape varieties which are easily recognizable by consumers and have a wide commercial appeal. To win an award for a wine made from an unknown variety and produced in an unkown terroir that was revived mainly for historical purposes means that this wine is not only important for the history of wine-making but that it is also appealing to the modern, wine-educated consumer. Be sure to get yourself a bottle or two or if you plan to be in Greece for awhile a case or two. *A terroir is a group of vineyards or even vines from the same region, belonging to a specific appellation, and sharing the same type of soil, weather conditions, grapes and wine making methods, which contribute to give the wine its characteristics. 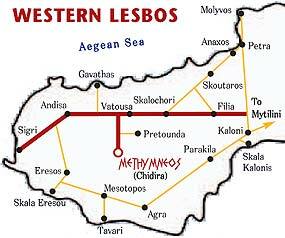 To visit Methymneos Winery, turn left at the 24th kilometre of the route Kaloni-Andisa-Sigri, immediately after the village of Vatousa. Then, follow the 7 kilometre road to the village of Chidira. The winery is at the entrance of the village. Signposts will lead you all along the way. An Ancient Wine is voted "Wine of the Year 2008"! An unknown new wine produced from a so far unknown grape variety was the surprise of a yearly cultural, culinary and wine tasting event with participations from more than 100 countries, held on the 23d of January at the United Nations Headquarters in Geneva. 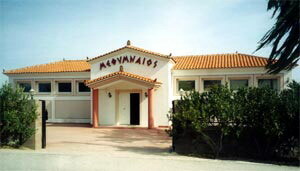 Nearly six hundred diplomats and journalists accredited to the United Nations were the voters who at their yearly event gave the title of wine of 2008 to "Methymneos" among dozens of known labels. This wine has been produced for the last few years on the lavas of a volcano at the western part of the Greek island of Lesbos, where the renowned Petrified Forest is situated. the Foreign Press Association in Switzerland and Liechtenstein that their choice did not surprise him, as the so far unknown "chidiriotiko" grape variety, from which he makes his wine, is a revival and redevelopment of the ancient variety that was cultivated on the same volcanic soil as today. This variety produced the famous "Lesbian Wine", which was the most expensive in the markets of Athens and Rome in antiquity. The name "Methymneos" is an epithet of Dionysus, god of wine in ancient Greece, which means "wine of wedding and music", added Lambrou.